24-7 Electrics is a family run business based in Southampton who has two electricians, Mike Baker who has been in the industry for 25 years working on commercial developments and domestic installations. Hannah Baker who passed the 17th edition wiring regulations Exam City & Guilds 2380 in June 2013 and is now keen to further her career as a female Electrician. 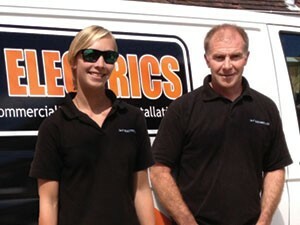 We are available 24 hours a day 365 days a year for all emergency and electrical installation work. As a friendly and reliable electrical service at a sensible price within the Southampton Hampshire area, we have many satisfied customers who are happy to give their recommendation. All of our electrical installation work comes with a BS7671 electrical installation certificate and is installed in accordance with the current regulations. We are members of NICEIC the UK’s leading voluntary regulatory body for the electricians. The Buy with Confidence trading standards scheme run by Hampshire County Council and of course Checkatrade, so rest assured if you hire us, all the work carried out will be installed correctly and safely with no fuss or hidden additional charges. Surviving on our reputation built up over the last 12 years there is a trend of repeat customers and recommendations from previous happy satisfied customers.